Researchers have created a transparent sensor that could help monitor brain activity without visually blocking it. The sensor could also be used in lenses to detect injuries to the retina or even glaucoma. A team of researchers from the University of Wisconsin-Madison have developed an invisible implantable medical sensor that could help us understand the human brain better. 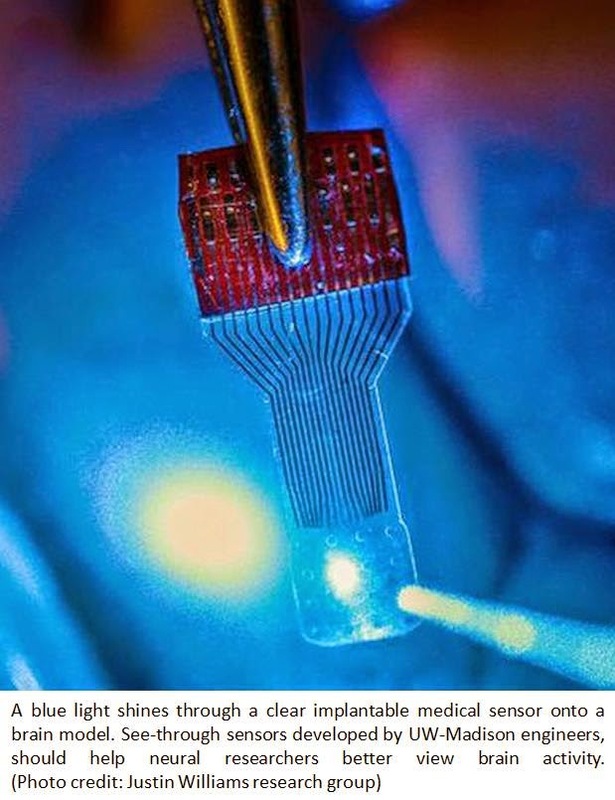 The team described its technology, which has applications in fields ranging from neuroscience to cardiac care and even contact lenses, in the journal Nature Communications. Neural researchers study, monitor or stimulate the brain using imaging techniques in conjunction with implantable sensors that allow them to continuously capture and associate fleeting brain signals with the brain activity they can see. However, it’s difficult to see brain activity when there are sensors blocking the view. “One of the holy grails of neural implant technology is that we’d really like to have an implant device that doesn’t interfere with any of the traditional imaging diagnostics,” says Justin Williams, a professor of biomedical engineering and neurological surgery at UW-Madison. “A traditional implant looks like a square of dots, and you can’t see anything under it. We wanted to make a transparent electronic device.” They chose graphene, a material gaining wider use in everything from solar cells to electronics, because of its versatility and biocompatibility. And in fact, they can make their sensors incredibly flexible and transparent because the electronic circuit elements are only 4 atoms thick – an astounding thinness made possible by graphene’s excellent conductive properties. “It’s got to be very thin and robust to survive in the body,” says Zhenqiang (Jack) Ma, a professor of electrical and computer engineering. “It is soft and flexible, and a good tradeoff between transparency, strength and conductivity.” Drawing on his expertise in developing revolutionary flexible electronics, the team designed and fabricated the microelectrode arrays, which – unlike existing devices – work in tan dem with a range of imaging technologies. “Other implantable microdevices might be transparent at one wavelength, but not at others, or they lose their properties,” says Ma. “Our devices are transparent across a large spectrum – all the way from ultraviolet to deep infrared. We’ve even implanted them and you cannot find them in an MR scan.” The transparent sensors could be a boon to neuromodulation therapies, which physicians increasingly are using to control symptoms, restore function, and relieve pain in patients with diseases or disorders such as hypertension, epilepsy, Parkinson’s disease, or others. Currently researchers are limited in their ability to directly observe how the body generates electrical signals, as well as how it reacts to externally generated electrical signals. Clear electrodes in combination with recent technological advances in optogenetics and optical voltage probes will enable researchers to isolate those biological mechanisms. This fundamental knowledge could be catalytic in dramatically improving existing neuromodulation therapies and identifying new therapies. While the team centered its efforts on neural research, they already have started to explore other medical device applications. For example, working with researchers at the University of Illinois-Chicago, they prototyped a contact lens instrumented with dozens of invisible sensors to detect injury to the retina; the UIC team is exploring applications such as early diagnosis of glaucoma.